Like magic, this Long hair remedy will solve all your hair problems. You have a short hair but you want it longer? Applying coffee mixed with olive oil will lengthen your hair within two weeks. This simple hair remedy is also good for you if you want your hair to appear very dark and beautiful. Using this remedy on your hair will make your hair healthy, smooth and less flaky. 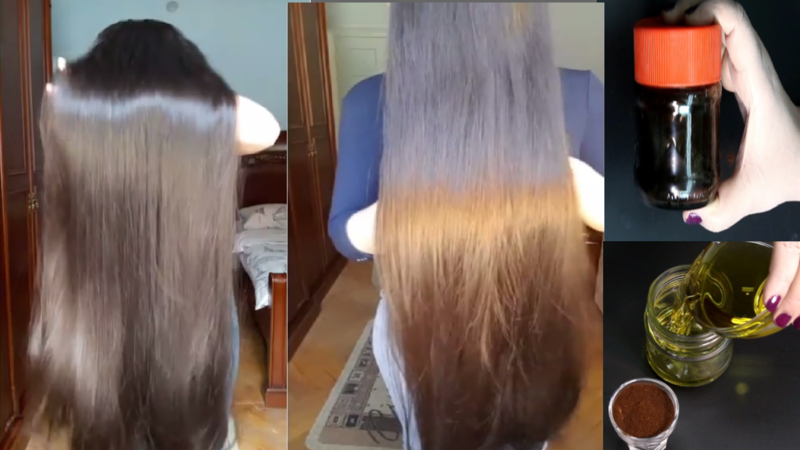 You will be shocked to see the changes within 2 weeks if you use this hair remedy. Coffee has been proven to be a very good ingredient for home remedies that facilitate hair growth. • Caffeine in coffee is a natural stimulant for hair follicles. This brings about remarkable increase in your hair length when coffee is applied on your scalp. • In addition, Coffee is also a powerful antioxidant which protects the hair cuticle and shield it from the harmful effects of UV rays from the sun. • As an exfoliant, coffee helps to remove death skin cells from your scalp. When dead cells are removed, darker and longer hairs are produced. • Olive oil has been proven to treat some certain hair diseases such as dandruff which can make the hair overly dry and can cause it to break. • Olive oil contains moisturising properties which help retain the moisture contents of your hair and scalp. Using Olive oil on your scalp makes your hair easy to comb and style into your preferred taste. • In addition, Olive oil is rich in Vitamins such as Vitamin E which is a powerful antioxidant. This antioxidant property of Olive Oil protects the hair follicles from harm and maintains the Keratin that gives your hair it’s healthy and beautiful structure. The preparation of this hair remedy is easy. To begin with, pour out 50ml of Olive oil into a clean container. Then add about 3-4 teaspoons of powdered coffee into the same container that has the Olive oil. Cover the container tightly and shake for about 30 to 60 seconds until the content mixes properly. Then keep this mixture and allow it for 5 minutes. This will ensure that the chemical compounds in the ingredients interact with one another to give you an effective remedy. After 5 minutes, pour this mixture into a pan and heat for 3 minutes. Allow to cool before storage. Your Coffee and Olive oil hair remedy is ready to use. Apply this hair remedy all over your scalp. Do a gentle massage around the roots of your hair for about 3 minutes before moving to the tip of your hair around your neck area. This movement is important for the remedy to get properly absorbed into the hair pores. Use this remedy 3 times a week to get maximum benefit. You will see result within 2 weeks. This remedy should be stored in a tight container and kept in a cool environment. Avoid putting it in direct contact with sunlight. yes it will work on all types of hair. Pls, is it meant to be washed off? Hi, how long should I leave the mixture in my hair before washing it out? Thanks. can we store the mixture and reuse it? ?